The G090G1L Progressive Cavity Pump is designed for activated sludge pumping for liquids with high biosolids content or heavy waste solids in the (RAS) Return Activated Sludge process in wastewater treatment facilities. The G090G1L’s low shear and high torque output enables it to pump the thickest activated sludges back to the secondary treatment tank with no issues. Solids handling capability of up to 50% by weight allows even the toughest application to be pumped along with a flow rate of 90 gallons/100 revolutions @ 293 to 405 GPM with a temperature resistance of up to 350° degrees Fahrenheit. All parts for the G090G1L such as rotors, stators and internal wetted parts such as seals and connecting rods dimensionally interchange as aftermarket replacements with other popular manufacturers pump models like the *Moyno® 2000 Series, the *Tarby® Century V Series, and the *Continental® CG Series of Progressive Cavity Pumps saving you thousands of dollars in replacement part costs. 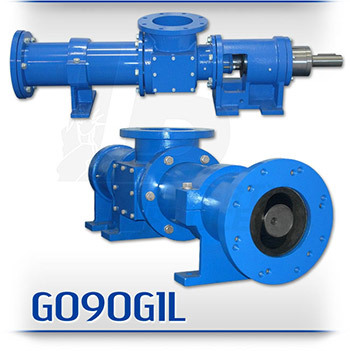 The G090G1L is a standard ANSI flanged pump design manufactured with high strength cast Iron or 316 Stainless Steel pump casings and designed in 1, 2 and up to 4 stages for 85, 170, and 350 psi discharge pressures making it an ideal low-cost, maintenance free drop-in replacement pump. Standard suction and discharge flange size for the G090G1L is 8″. The pumps modular design comes with a positively sealed, hardened gear joint assembly, hardened tool steel rotors or stainless steel rotors both with hard chrome plating for long-life pumping and a wide selection of stators in Buna Nitrile, Viton®, EPDM and Natural Rubber. All other wetted parts are either carbon steel or 316 stainless steel. The standard seal design is a set of packing with a Lantern Ring and flush connections. Mechanical seal options are readily available. Returning the sludge back to the secondary tank in the RAS process requires a pump with a flexible design, the G090G1l is that pump.